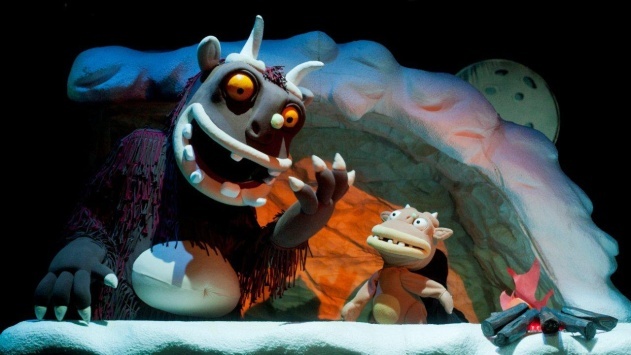 The Gruffalo’s Child is a sequel of The Gruffalo, which was premiered with great success at the Lutkovno gledališče Ljubljana / Ljubljana Puppet Theatre in April 2013. Both picture books were written by the English playwright Julia Donaldson. The Gruffalo (1999) is a genuine international publishing phenomenon as it was translated into 50 languages and sold out in more than 4 million copies all over the world. Its sequel, The Gruffalo's Child, published back in 2004, is no less famous or known than its predecessor. In The Gruffalo a cunning Mouse invents a monster-like friend and a real gruffalo, “with tusks as sharp as knives, and claws askew, with jaws that terrorise and fangs that scare too!”, whose favourite food happens to be grilled fox meat, or ice cream in owl’s juice, or roasted snake. The mouse invents all that in order to scare off the voracious predators, who are clearly intending to eat him. Soon the Mouse is shocked to find out that the Gruffalo really exists! Will he be able to corner the real thing as well? The answer to that question is revealed in The Gruffalo’s Child, where the “big, bad mouse” puts the fear of God into the small and big Gruffalos alike. He scares the animals in the deep dark wood, wherein the Gruffalo’s child sets off despite her father’s warnings. But the “big, bad mouse” does not exist at all! Or, maybe he does!? Lutkovna predstava Zverjašček, napovednik / The Gruffalo's Child, trailer from Lutkovno gledališče Ljubljana on Vimeo. Puppets, Set and Costumes Production: Zoran Srdić, Mitja Ritmanič, Iztok Bobić, Sandra Birjukov, Polona Černe, Marjeta Valjavec, Brina Fekonja, Jernej Remše s. p., Špela Ulaga, Gregor Bajc, Uroš Mehle s.p.